New Orleans-based painter Auseklis Ozols spent decades producing beautiful work that usually depicts real-life subject matter. 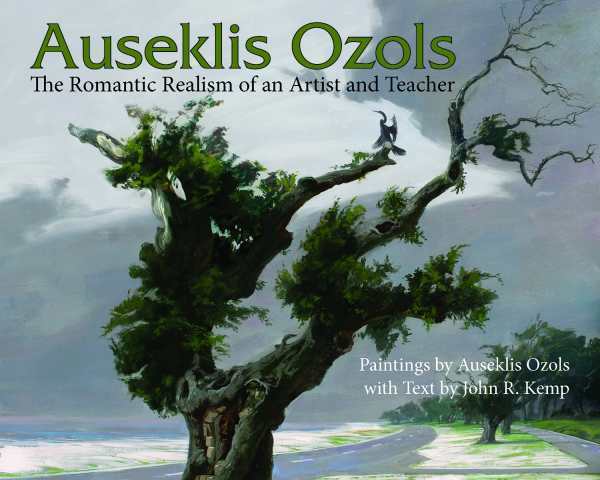 His work is now celebrated in John Kemp’s book, which features dozens of Ozols’s works and shows his versatility. The book begins with a short biography of the artist, who was born in Latvia, where his family survived German occupation in World War II and time in the Dachau concentration camp. He moved to the United States in 1949. The text describes how Ozols developed his throwback style of painting at a time when modern and avant-garde works dominated the art scene. Color images of the artist’s work are grouped into categories. Ozols is known for the diversity of his techniques; he is rare among modern painters for switching between landscapes, still lifes, and portraits. His landscapes are particularly impressive. Primarily oil works on canvas or linen, they feature vivid colors and textures, and show off Louisiana’s natural and human-made beauty. Apotheosis of Louisiana depicts a pelican landing on a flagpole before a backdrop of red-lit clouds; At the River features a scene of people and animals along a wooden river dock. Standout murals include 1996’s The Banjo Mural and 2005’s Plantation, in which Ozols combines trees, portraits, and colorful skies to create memorable scenes. The book also includes a series of Ozols’s portraits, from nudes to a self-portrait of the artist at work. His still lifes sometimes depict traditional subjects like flowers in a vase or fruit, and other times include a crab, a pile of eyeglasses, the remnants of a Mardi Gras party, or nautilus shells arranged like the apostles at the Last Supper. The artist’s senses of proportion and perspective are strong throughout. Auseklis Ozols collects lovely, sometimes old-fashioned works by a contemporary master.